This event has been postponed. We sincerely regret any inconvenience. What: First Person Singular presents Shine Perishing Republic! Robinson Jeffers Speaks When: Wednesday, October 23, 7:30 pm Where: Pegasus Books on Solano What else: Wheelchair accessible; refreshments served. This event is free. 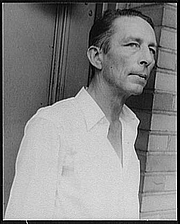 Robinson Jeffers is currently considered a "single author." If one or more works are by a distinct, homonymous authors, go ahead and split the author. Robinson Jeffers is composed of 6 names. You can examine and separate out names.